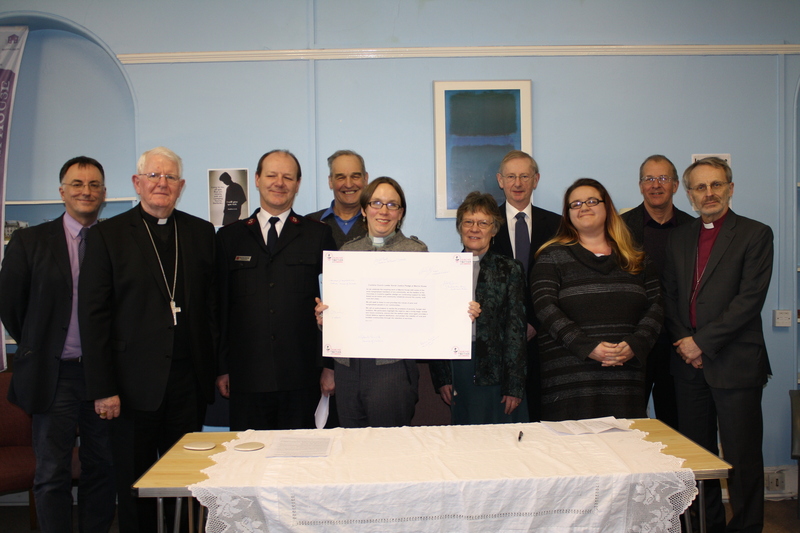 On March 6 the Church Leaders of Cumbria got together to sign a pledge of support for social action and social justice. The Leaders, from member denominations of Churches Together in Cumbria, signed the pledge at Manna House, Kendal, which is a Christian-based social action project doing cutting-edge work with homeless and vulnerable people. The Church Leaders who signed the pledge are Bill Bewley, representative of the Religious Society of Friends (Quakers); Bishop Michael Campbell, the Roman Catholic Bishop of Lancaster; Rev Andrew Dodd, Network Minister for Cumbria of the North Western Baptist Association; Bishop Robert Freeman, the Anglican Suffragan Bishop of Penrith; Major Drew McCombe, Divisional Leader of the North Western Division of the Salvation Army; Rev Jennet McLeod, Deputy Chair of the Cumbria District of the Methodist Church; and Rev Sarah Moore, Area President for Cumbria of the North Western Synod of the United Reformed Church. Also attending are the Chair of the Social Responsibility Forum of Churches Together in Cumbria; the Chair of Churches Together in Kendal; the Manager of King’s Food Bank; the chair of Lancaster Diocesan Faith and Justice Commission, who is priest of Kendal Roman Catholic Parish; and the Community Worker from the Cornerstone project at Sandylands Methodist Church. “As we celebrate the inspiring work of Manna House with some of the most marginalised members of our community, we the leaders of the Churches in Cumbria together pledge our continuing support for faith-based social action and community initiatives around the county, both rural and urban. We will seek to listen to and prioritise the voices of poor and marginalised people in our communities.